If your hard drive has failed you might be thinking all your precious photos etc may be lost forever. However, we can recover lost files in most cases and transfer it onto a portable media like a usb memory stick. Data recovery has a better chance if we get your computer asap. It can be a lengthy process depending on how many files you have on your hard drive. Music files in particular can exceed several hundred Gigabytes in size and can take a very long time. Sometimes we can apply filters so we can search for your most important documents. We recommend that anything important should be stored in an online back up location. We recommend Sky Drive and G Drive as two free solutions. We can do this for you and show you how to sync your files so they never get lost again in the event of hard drive failure. 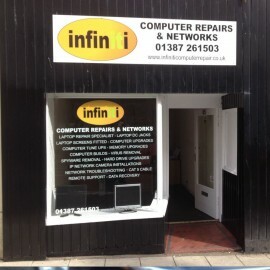 Infiniti Computer Repair will assist you in the data recovery of your computer.